A viriety of pressure washer accessories, extension wands, hoses, nozzles, low pressure sprayers featuring BE Pressure equipment. 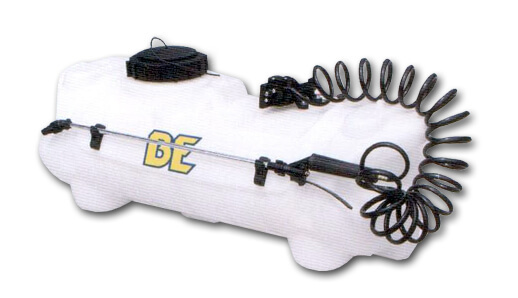 The ATV spot sprayers come with either a 15 or 25 gallon tank, a 15Ft hose, a U45050000 spray gun, and a 1.0 gpm 12 Volt Pump. Our lightweight handheld 2 gallon hand operated poly chemical sprayer is an all plastic sprayer with no metal or rubber parts exposed. Check out our extensive chemical line for easy clean up of weeds, bugs or even your tires and rims. Included in this kit is a 28” long wand, 44” of hose, carry strap and a cone nozzle. The 25 gallon acid applicator system is perfect for acid solutions or hostile chemicals. Pump is pre-plumbed to tank and ready for hook-up to your air supply. Comes standard with 75' of 1/4” run tubing and trigger spray gun with extension. Add this to your truck wash detail system, ideal for applying aluminium brightener to tractor trailers.